Located in a beautiful setting facing the Pacific Ocean, 183 km north of Puerto Aisén and 198 km from Coihaique, this small town offers a variety of adventurous activities in its rugged countryside. You reach the town 33 km along a side road, which branches off the Carretera Austral. It is connected by both land and sea transport with the main towns of the Region. The small town of Puerto Cisnes is known for its orderly layout, the friendliness of its inhabitants and especially for its handicraft in fish-skin, which are gaining a great reputation for their originality. A full range of tourist services is available. Located near the coast, about 60 km north of Puerto Cisnes, this small village is characterized by its old houses with their German architecture, and is well known for its factory of hand-crafted carpets. A full range of tourist services is available. Located some 48 km from Puerto Cisnes, these hot springs offer every comfort in a spectacular Patagonian setting. The name, Puyuhuapi, literally means “place of puyes”, a very popular fish with fishing professionals. The complex stands on the beautiful Bahía Dorita, on the Seno Ventisquero, and the thermal waters rise from beneath the Melimoyu Volcano. The waters are recommended for treating rheumatic complaints and for skin treatments. They can reach temperatures of up to 85°C. This small town is located at the confluence of the Rosselet and Palena rivers, which are excellent for outdoor pursuits. You can also go fishing on the Rosselot and Risopatrón lakes. A full range of tourist services is available. This port is on the delta of the Río Palena. A full range of tourist services is available here and you can reach the port by sailing down the river from La Junta, or on barges which offer weekly sailings from Quellón. There are beaches, seafood, fishing and sailing. This small picturesque town arose from the need of the fisherman in the area to have a fixed base. The town can only be reached by sea and you can go fishing and sailing, and enjoy the beauty of the surrounding countryside and channels. This is a small fishing creek which is reached by sea in small craft from Chacabuco and Puerto Cisnes. 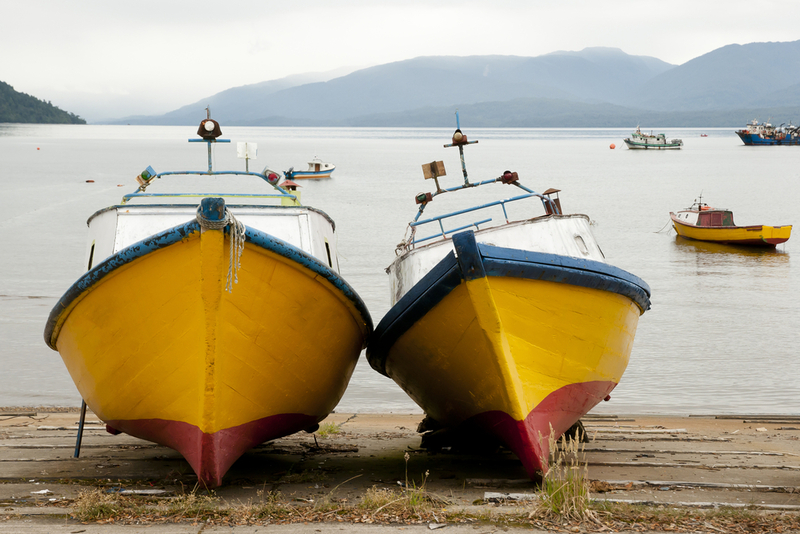 Here you can go fishing and sailing, and visit the Parque Nacional Isla Magdelena. You can reach this place only by sea from Quellón. Here you can enjoy absolute silence and tranquility while you fish, or just relax and contemplate the beautiful landscape. 100 km north of Puerto Cisnes on the Carretera Austral, and 167 km north of Coihaique, the highway runs through this park for more than 40 km, making it easier to admire its natural beauty. It covers 154,093 hectares and begins a little north of Lago Risopatrón. The main attractions of this park are its glaciers, rivers and especially its hanging glacier, Queulat; the Salto del Padre García, Lago Risopatrón, Laguna Los Pumas, the area of the Cuesta Queulat, the Laguna Témpanos and the Salto del Cóndor.